For other uses, see Velociraptor (disambiguation). Velociraptor (/vɪˈlɒsɪræptər/; meaning "swift seizer" in Latin) is a genus of dromaeosaurid theropod dinosaur that lived approximately 75 to 71 million years ago during the latter part of the Cretaceous Period. Two species are currently recognized, although others have been assigned in the past. 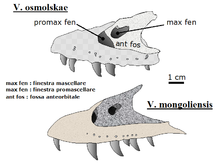 The type species is V. mongoliensis; fossils of this species have been discovered in Mongolia. A second species, V. osmolskae, was named in 2008 for skull material from Inner Mongolia, China. Smaller than other dromaeosaurids like Deinonychus and Achillobator, Velociraptor nevertheless shared many of the same anatomical features. It was a bipedal, feathered carnivore with a long tail and an enlarged sickle-shaped claw on each hindfoot, which is thought to have been used to tackle and disembowel prey. Velociraptor can be distinguished from other dromaeosaurids by its long and low skull, with an upturned snout. Velociraptor (commonly shortened to "raptor") is one of the dinosaur genera most familiar to the general public due to its prominent role in the Jurassic Park motion picture series. In real life, however, Velociraptor was roughly the size of a turkey, considerably smaller than the approximately 2 m (7 ft) tall and 80 kg (180 lb) reptiles seen in the films (which were based on members of the related genus Deinonychus). Today, Velociraptor is well known to paleontologists, with over a dozen described fossil skeletons, the most of any dromaeosaurid. One particularly famous specimen preserves a Velociraptor locked in combat with a Protoceratops. Velociraptor was a mid-sized dromaeosaurid, with adults measuring up to 2.07 m (6.8 ft) long, 0.5 m (1.6 ft) high at the hip, and weighing up to 15 kg (33 lb), though there is a higher estimate of 19.7 kg (43 lb). The skull, which grew up to 25 cm (9.8 in) long, was uniquely up-curved, concave on the upper surface and convex on the lower. The jaws were lined with 26–28 widely spaced teeth on each side, each more strongly serrated on the back edge than the front. Velociraptor, like other dromaeosaurids, had a large manus ('hand') with three strongly curved claws, which were similar in construction and flexibility to the wing bones of modern birds. The second digit was the longest of the three digits present, while the first was shortest. The structure of the carpal (wrist) bones prevented pronation of the wrist and forced the 'hands' to be held with the palmar surface facing inwards (medially), not downwards. The first digit of the foot, as in other theropods, was a small dewclaw. However, whereas most theropods had feet with three digits contacting the ground, dromaeosaurids like Velociraptor walked on only their third and fourth digits. The second digit, for which Velociraptor is most famous, was highly modified and held retracted off the ground. It bore a relatively large, sickle-shaped claw, typical of dromaeosaurid and troodontid dinosaurs. This enlarged claw, which could grow to over 6.5 cm (2.6 in) long around its outer edge, was most likely a predatory device used to tear into or restrain struggling prey. A lack of quill knobs does not necessarily mean that a dinosaur did not have feathers. Finding quill knobs on Velociraptor, though, means that it definitely had feathers. This is something we'd long suspected, but no one had been able to prove. According to Turner and co-authors Norell and Peter Makovicky, quill knobs are not found in all prehistoric birds, and their absence does not mean that an animal was not feathered – flamingos, for example, have no quill knobs. However, their presence confirms that Velociraptor bore modern-style wing feathers, with a rachis and vane formed by barbs. The forearm specimen on which the quill knobs were found (specimen number IGM 100/981) represents an animal 1.5 meters (4.9 feet) in length and 15 kilograms (33 pounds) in weight. Based on the spacing of the six preserved knobs in this specimen, the authors suggested that Velociraptor bore 14 secondaries (wing feathers stemming from the forearm), compared with 12 or more in Archaeopteryx, 18 in Microraptor, and 10 in Rahonavis. This type of variation in the number of wing feathers between closely related species, the authors asserted, is to be expected, given similar variation among modern birds. During an American Museum of Natural History expedition to the Outer Mongolian Gobi Desert, on 11 August 1923 Peter Kaisen recovered the first Velociraptor fossil known to science: a crushed but complete skull, associated with one of the raptorial second toe claws (AMNH 6515). In 1924, museum president Henry Fairfield Osborn designated the skull and claw (which he assumed to come from the hand) as the type specimen of his new genus, Velociraptor. This name is derived from the Latin words velox ('swift') and raptor ('robber' or 'plunderer') and refers to the animal's cursorial nature and carnivorous diet. Osborn named the type species V. mongoliensis after its country of origin. 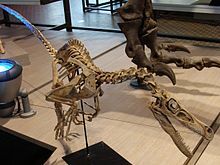 Earlier that year, Osborn had mentioned the animal in a popular press article, under the name "Ovoraptor djadochtari" (not to be confused with the similarly named Oviraptor). However, because the name "Ovoraptor" was not published in a scientific journal or accompanied by a formal description, it is considered a nomen nudum ('naked name'), and the name Velociraptor retains priority. While North American teams were shut out of communist Mongolia during the Cold War, expeditions by Soviet and Polish scientists, in collaboration with Mongolian colleagues, recovered several more specimens of Velociraptor. The most famous is part of the famous "Fighting Dinosaurs" specimen (GIN 100/25), discovered by a Polish-Mongolian team in 1971. This fossil preserves a single Velociraptor in the midst of battle against a lone Protoceratops. This specimen is considered a national treasure of Mongolia, although in 2000 it was loaned to the American Museum of Natural History in New York City for a temporary exhibition. Between 1988 and 1990, a joint Chinese-Canadian team discovered Velociraptor remains in northern China. American scientists returned to Mongolia in 1990, and a joint Mongolian-American expedition to the Gobi, led by the American Museum of Natural History and the Mongolian Academy of Sciences, turned up several well-preserved skeletons. One such specimen, IGM 100/980, was nicknamed "Ichabodcraniosaurus" by Norell's team because the fairly complete specimen was found without its skull (an allusion to the Washington Irving character Ichabod Crane). This specimen may belong to Velociraptor mongoliensis, but Norell and Makovicky concluded that it was not complete enough to say for sure, and it awaits a formal description. Velociraptor is a member of the group Eudromaeosauria, a derived sub-group of the larger family Dromaeosauridae. It is often placed within its own "subfamily", Velociraptorinae. In phylogenetic taxonomy, Velociraptorinae is usually defined as "all dromaeosaurs more closely related to Velociraptor than to Dromaeosaurus." However, dromaeosaurid classification is highly variable. Originally, the subfamily Velociraptorinae was erected solely to contain Velociraptor. Other analyses have often included other genera, usually Deinonychus and Saurornitholestes, and more recently Tsaagan. However, several studies published during the 2010s, including expanded versions of the analyses that found support for Velociraptorinae, have failed to resolve it as a distinct group, but rather have suggested it is a paraphyletic grade which gave rise to the Dromaeosaurinae. In the past, other dromaeosaurid species, including Deinonychus antirrhopus and Saurornitholestes langstoni, have sometimes been classified in the genus Velociraptor. Since Velociraptor was the first to be named, these species were renamed Velociraptor antirrhopus and V. langstoni. 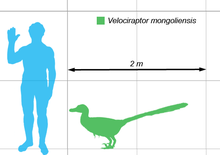 However, the only currently recognized species of Velociraptor are V. mongoliensis and V. osmolskae. When first described in 1924, Velociraptor was placed in the family Megalosauridae, as was the case with most carnivorous dinosaurs at the time (Megalosauridae, like Megalosaurus, functioned as a sort of 'wastebin' taxon, where many unrelated species were grouped together). As dinosaur discoveries multiplied, Velociraptor was later recognized as a dromaeosaurid. All dromaeosaurids have also been referred to the family Archaeopterygidae by at least one author (which would, in effect, make Velociraptor a flightless bird). The "Fighting Dinosaurs" specimen, found in 1971, preserves a Velociraptor mongoliensis and Protoceratops andrewsi in combat and provides direct evidence of predatory behavior. When originally reported, it was hypothesized that the two animals drowned. However, as the animals were preserved in ancient sand dune deposits, it is now thought that the animals were buried in sand, either from a collapsing dune or in a sandstorm. Burial must have been extremely fast, judging from the lifelike poses in which the animals were preserved. Parts of the Protoceratops are missing, which has been seen as evidence of scavenging by other animals. Comparisons between the scleral rings of Velociraptor, Protoceratops, and modern birds and reptiles indicates that Velociraptor may have been nocturnal, while Protoceratops may have been cathemeral, active throughout the day during short intervals, suggesting that the fight may have occurred at twilight or during low-light conditions. Remains of Deinonychus, a closely related dromaeosaurid, have commonly been found in aggregations of several individuals. Deinonychus has also been found in association with a large herbivore, Tenontosaurus, which has been seen as evidence of cooperative hunting. The only solid evidence for social behavior among dromaeosaurids comes from a Chinese trackway of fossil footprints, which shows six individuals of a large species moving as a group, though no evidence of cooperative hunting was found. Although many isolated fossils of Velociraptor have been found in Mongolia, none were closely associated with any other individuals. Therefore, while Velociraptor is commonly depicted as a pack hunter, as in Jurassic Park, there is only limited fossil evidence to support this theory for dromaeosaurids in general, and none specific to Velociraptor itself. The pack hunting theory was based on a discovery of several specimens of Deinonychus found around the remains of a Tenontosaurus. No other group of dromaeosaurids has been found in close association. In 2011, Denver Fowler and colleagues suggested a new method by which dromaeosaurs like Velociraptor and similar dromaeosaurs may have captured and restrained prey. This model, known as the "raptor prey restraint" (RPR) model of predation, proposes that dromaeosaurs killed their prey in a manner very similar to extant accipitrid birds of prey: by leaping onto their quarry, pinning it under their body weight, and gripping it tightly with the large, sickle-shaped claws. These researchers proposed that, like accipitrids, the dromaeosaur would then begin to feed on the animal while it was still alive and prey death eventually came from blood loss and organ failure. This proposal is based primarily on comparisons between the morphology and proportions of the feet and legs of dromaeosaurs to several groups of extant birds of prey with known predatory behaviors. Fowler found that the feet and legs of dromaeosaurs most closely resemble those of eagles and hawks, especially in terms of having an enlarged second claw and a similar range of grasping motion. The short metatarsus and foot strength, however, would have been more similar to that of owls. The RPR method of predation would be consistent with other aspects of Velociraptor's anatomy, such as their unusual jaw and arm morphology. The arms, which could exert a lot of force but were likely covered in long feathers, may have been used as flapping stabilizers for balance while atop a struggling prey animal, along with the stiff counterbalancing tail. The jaws, thought by Fowler and colleagues to be comparatively weak, would have been useful for row saw motion bites like the modern day Komodo dragon, which also has a weak bite, to finish off its prey if the kicks weren't powerful enough. These predatory adaptations working together may also have implications for the origin of flapping in paravians. In 2010, Hone and colleagues published a paper on their 2008 discovery of shed teeth of what they believed to be a Velociraptor near a tooth-marked jaw bone of what they believed to be a Protoceratops in the Bayan Mandahu Formation. The authors concluded that the find represented "late-stage carcass consumption by Velociraptor" as the predator would have eaten other parts of a freshly killed Protoceratops before biting in the jaw area. The evidence was seen as supporting the inference from the "Fighting Dinosaurs" fossil that Protoceratops was part of the diet of Velociraptor. In 2012, Hone and colleagues published a paper that described a Velociraptor specimen with a long bone of an azhdarchid pterosaur in its gut. This was interpreted as showing scavenging behaviour. One Velociraptor mongoliensis skull bears two parallel rows of small punctures that match the spacing and size of Velociraptor teeth. Scientists believe that the wound was likely inflicted by another Velociraptor during a fight. Further, because the fossil bone shows no sign of healing near the bite wounds, the injury probably killed it. Another specimen, found with the bones of an azhdarchid pterosaur within its stomach cavity, was carrying or recovering from an injury sustained to its ribs. From evidence on the pterosaur bones, which were devoid of pitting or deformations from digestion, the Velociraptor died shortly after, possibly from the earlier injury. All known specimens of Velociraptor mongoliensis were discovered in the Djadochta Formation (also spelled Djadokhta), in the Mongolian province of Ömnögovi. Species of Velociraptor have also been reported from the slightly younger Barun Goyot Formation of Mongolia, though these are indeterminate and may belong to a related genus instead. These geologic formations are estimated to date back to the Campanian stage (between 83 and 70 million years ago) of the Late Cretaceous Epoch. V. mongoliensis has been found at many of the most famous and prolific Djadochta localities. The type specimen was discovered at the Flaming Cliffs site (also known as Bayn Dzak and Shabarakh Usu), while the "Fighting Dinosaurs" were found at the Tugrig locality (also known as Tugrugeen Shireh). The well-known Barun Goyot localities of Khulsan and Khermeen Tsav have also produced remains which may belong to Velociraptor or a related genus. Teeth and partial remains attributed to juvenile V. mongoliensis have also been reported from the Bayan Mandahu Formation, a prolific site in Inner Mongolia, China that is contemporaneous with the Djadochta Formation. However, these fossils had not been prepared or studied as of 2008. A partial adult skull from the Bayan Mandahu Formation has been assigned to a distinct species, Velociraptor osmolskae. All of the fossil sites that have yielded Velociraptor remains preserve an arid environment with fields of sand dunes and only intermittent streams, although the younger Barun Goyot environment seems to have been slightly wetter than the older Djadochta. The posture of some complete fossils, as well as the mode of preservation most show within structureless sandstone deposits, may show that a number of specimens were buried alive during sandstorm events common to the three environments. Many of the same genera were present across these formations, though they varied at the species level. For example, the Djadochta was inhabited by Velociraptor mongoliensis, Protoceratops andrewsi, and Pinacosaurus grangeri, while the Bayan Mandahu was home to Velociraptor osmolskae, Protoceratops hellenikorhinus, and Pinacosaurus mephistocephalus. These differences in species composition may be due a natural barrier separating the two formations, which are relatively close to each other geographically. However, given the lack of any known barrier which would cause the specific faunal compositions found in these areas, it is more likely that those differences indicate a slight time difference. 2003 restoration by Raúl Martín showing a featherless Velociraptor battling Protoceratops. The creature continues to be rendered in this outdated way in many popular images. Velociraptor are well known for their role as vicious and cunning killers thanks to their portrayal in the 1990 novel Jurassic Park by Michael Crichton and its 1993 film adaptation, directed by Steven Spielberg. The "raptors" portrayed in Jurassic Park were actually modeled after the closely related dromaeosaurid Deinonychus. Paleontologists in both the novel and film excavate a skeleton in Montana, far from the central Asian range of Velociraptor but characteristic of the Deinonychus range. 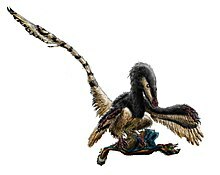 A character in Crichton's novel also states that "Deinonychus is now considered one of the velociraptors", which suggests that Crichton used the controversial taxonomy proposed by Gregory S. Paul, even though the "raptors" in the novel are at another point referred to as V. mongoliensis. Crichton met with the discoverer of Deinonychus, John Ostrom, several times at Yale University to discuss details of the animal's possible range of behaviors and appearance. Crichton at one point apologetically told Ostrom that he had decided to use the name Velociraptor in place of Deinonychus because the former name was "more dramatic". According to Ostrom, Crichton stated that the Velociraptor of the novel was based on Deinonychus in almost every detail, and that only the name had been changed. The Jurassic Park filmmakers also requested all of Ostrom's published papers on Deinonychus during production. They portrayed the animals with the size, proportions, and snout shape of Deinonychus rather than Velociraptor. Production on Jurassic Park began before the discovery of the large dromaeosaurid Utahraptor was made public in 1991, but as Jody Duncan wrote about this discovery: "Later, after we had designed and built the Raptor, there was a discovery of a Raptor skeleton in Utah, which they labeled 'super-slasher'. They had uncovered the largest Velociraptor to date - and it measured five-and-a-half-feet tall, just like ours. So we designed it, we built it, and then they discovered it. That still boggles my mind." Spielberg was particularly pleased with the discovery of the Utahraptor because of the boost it gave to the velociraptors in his film. Spielberg's name was briefly considered for naming of the new dinosaur. In reality, Velociraptor, like many other maniraptoran theropods, was covered in feathers. ^ a b c d e f Osborn, Henry F. (1924a). "Three new Theropoda, Protoceratops zone, central Mongolia". American Museum Novitates. 144: 1–12. hdl:2246/3223. ^ a b c d e f g Godefroit, Pascal; Currie, Philip J.; Li, Hong; Shang, Chang Yong; Dong, Zhi-ming (2008). "A new species of Velociraptor (Dinosauria: Dromaeosauridae) from the Upper Cretaceous of northern China". Journal of Vertebrate Paleontology. 28 (2): 432–438. doi:10.1671/0272-4634(2008)28[432:ANSOVD]2.0.CO;2. ^ a b Paul, Gregory S. (1988). Predatory Dinosaurs of the World. New York: Simon & Schuster. p. 464. ISBN 978-0-671-61946-6. ^ a b Barsbold, Rinchen; Osmólska, Halszka (1999). "The skull of Velociraptor (Theropoda) from the Late Cretaceous of Mongolia". Acta Palaeontologica Polonica. 44 (2): 189–219. ^ a b c d Paul, Gregory S. (2002). Dinosaurs of the Air: The Evolution and Loss of Flight in Dinosaurs and Birds. Baltimore: Johns Hopkins University Press. ISBN 978-0-8018-6763-7. ^ a b c d e Norell, Mark A.; Makovicky, Peter J. (1999). "Important features of the dromaeosaurid skeleton II: information from newly collected specimens of Velociraptor mongoliensis". American Museum Novitates. 3282: 1–45. hdl:2246/3025. ^ a b Fowler, D.W.; Freedman, E.A. ; Scannella, J.B.; Kambic, R.E. (2011). "The Predatory Ecology of Deinonychus and the Origin of Flapping in Birds". PLoS ONE. 6 (12): e28964. Bibcode:2011PLoSO...628964F. doi:10.1371/journal.pone.0028964. PMC 3237572. PMID 22194962. ^ a b c Barsbold, Rinchen (1983). "Carnivorous dinosaurs from the Cretaceous of Mongolia". Transactions of the Joint Soviet-Mongolian Paleontological Expedition. 19: 5–119. ^ a b c d e Turner, A.H.; Makovicky, P.J. ; Norell, M.A. (2007). "Feather quill knobs in the dinosaur Velociraptor". Science. 317 (5845): 1721. Bibcode:2007Sci...317.1721T. doi:10.1126/science.1145076. PMID 17885130. ^ Xu, Xing; Zhou, Zhonghe; Wang, Xiaolin; Kuang, Xuewen; Zhang, Fucheng; Du, Xiangke (2003). "Four-winged dinosaurs from China". Nature. 421 (6921): 335–340. Bibcode:2003Natur.421..335X. doi:10.1038/nature01342. PMID 12540892. ^ a b American Museum of Natural History. "Velociraptor had feathers." ScienceDaily 2007-09-20. Accessed 2010-08-20. ^ Osborn, Henry F. (1924b). "The discovery of an unknown continent". Natural History. 24: 133–149. ^ Kielan-Jaworowska, Zofia; Barsbold, Rinchen (1972). "Narrative of the Polish-Mongolian Paleontological Expeditions". Paleontologica Polonica. 27: 5–13. ^ a b c Barsbold, Rinchen (1974). "Saurornithoididae, a new family of theropod dinosaurs from Central Asia and North America". Paleontologica Polonica. 30: 5–22. ^ American Museum of Natural History (c. 2000). "Fighting Dinosaurs: New Discoveries from Mongolia: Exhibition Highlights". Archived from the original on 23 November 2010. Retrieved 20 August 2010. ^ Norell, Mark A.; Makovicky, Peter J. (1997). "Important features of the dromaeosaur skeleton: information from a new specimen". American Museum Novitates. 3215: 1–28. hdl:2246/3557. ^ Currie, Philip J. (1995). "New information on the anatomy and relationships of Dromaeosaurus albertensis (Dinosauria: Theropoda)". Journal of Vertebrate Paleontology. 15 (3): 576–591. doi:10.1080/02724634.1995.10011250. Archived from the original on 17 November 2007. ^ Norell, Mark A.; Clark, James M.; Turner, Alan H.; Makovicky, Peter J.; Barsbold, Rinchen; Rowe, Timothy (2006). "A new dromaeosaurid theropod from Ukhaa Tolgod (Omnogov, Mongolia)" (PDF). American Museum Novitates (Submitted manuscript). 3545: 1–51. doi:10.1206/0003-0082(2006)3545[1:ANDTFU]2.0.CO;2. hdl:2246/5823. ^ a b Norell, Mark A.; Makovicky, Peter J. (2004). "Dromaeosauridae". In Weishampel, David B.; Dodson, Peter; Osmólska, Halszka (eds.). The Dinosauria (Second ed.). Berkeley: University of California Press. pp. 196–209. ISBN 978-0-520-24209-8. ^ a b Carpenter, Kenneth (1998). "Evidence of predatory behavior by theropod dinosaurs" (PDF). Gaia. 15: 135–144. Archived from the original (PDF) on 19 July 2011. ^ Ostrom, John H. (1969). "Osteology of Deinonychus antirrhopus, an unusual theropod from the Lower Cretaceous of Montana". Bulletin of the Peabody Museum of Natural History. 30: 1–165. ^ Manning, P. L.; Payne, D.; Pennicott, J.; Barrett, P. M.; Ennos, R. A. (2006). "Dinosaur killer claws or climbing crampons?". Biology Letters. 2 (1): 110–112. doi:10.1098/rsbl.2005.0395. PMC 1617199. PMID 17148340. ^ Maxwell, W. Desmond; Ostrom, John H. (1995). "Taphonomy and paleobiological implications of Tenontosaurus-Deinonychus associations". Journal of Vertebrate Paleontology. 15 (4): 707–712. doi:10.1080/02724634.1995.10011256. Archived from the original on 27 September 2007. ^ Brinkman, Daniel L.; Cifelli, Richard L.; Czaplewski, Nicholas J. (1998). "First occurrence of Deinonychus antirrhopus (Dinosauria: Theropoda) in the Antlers Formation (Lower Cretaceous: Aptian-Albian) of Oklahoma" (PDF). Oklahoma Geological Survey Bulletin. 146: 1–27. ^ Li, Rihui; Lockley, M.G. ; Makovicky, P.J. ; Matsukawa, M.; Norell, M.A. ; Harris, J.D. ; Liu, M. (2007). "Behavioral and faunal implications of Early Cretaceous deinonychosaur trackways from China". Die Naturwissenschaften. 95 (3): 185–191. Bibcode:2008NW.....95..185L. doi:10.1007/s00114-007-0310-7. PMID 17952398. ^ a b c Hone, David; Choiniere, Jonah; Sullivan, Corwin; Xu, Xing; Pittman, Michael; Tan, Qingwei (2010). "New evidence for a trophic relationship between the dinosaurs Velociraptor and Protoceratops". Palaeogeography, Palaeoclimatology, Palaeoecology. 291 (3–4): 488–492. doi:10.1016/j.palaeo.2010.03.028. ^ Walker, Matt (6 April 2010). "Fossil find shows Velociraptor eating another dinosaur". BBC Earth News. Retrieved 20 August 2010. ^ Hone, D.; Tsuihiji, T.; Watabe, M.; Tsogtbaatr, K. (2012). "Pterosaurs as a food source for small dromaeosaurs". Palaeogeography, Palaeoclimatology, Palaeoecology. 331-332: 27. doi:10.1016/j.palaeo.2012.02.021. ^ Molnar, R. E., 2001, "Theropod paleopathology: a literature survey". In Mesozoic Vertebrate Life, edited by Tanke, D. H., and Carpenter, K., Indiana University Press, p. 337–363. ^ Ancient Fossil Remains Reveal Velociraptor's Last Meal. ScienceDaily, 6 March 2012. ^ Weishampel, David B.; Barrett, Paul M.; Coria, Rodolfo A.; Le Loueff, Jean; Xu, Xing; Zhao, Xijin; Sahni, Ashok; Gomani, Emily M.P. ; Noto, Christopher N. (2004). "Dinosaur distribution". In Weishampel, David B.; Dodson, Peter; Osmólska, Halszka (eds.). The Dinosauria (Second ed.). Berkeley: University of California Press. pp. 517–606. ISBN 978-0-520-24209-8. ^ a b c Nicholas R. Longrich; Philip J. Currie; Dong Zhi-Ming (2010). "A new oviraptorid (Dinosauria: Theropoda) from the Upper Cretaceous of Bayan Mandahu, Inner Mongolia". Palaeontology. 53 (5): 945–960. doi:10.1111/j.1475-4983.2010.00968.x. ^ Gradstein, Felix M.; Ogg, James G.; Smith, Alan G. (2005). A Geologic Time Scale 2004. Cambridge: Cambridge University Press. ISBN 978-0-521-78142-8. ^ a b Jerzykiewicz, Tomasz; Russell, Dale A. (1991). "Late Mesozoic stratigraphy and vertebrates of the Gobi Basin". Cretaceous Research. 12 (4): 345–377. doi:10.1016/0195-6671(91)90015-5. ^ Osmólska, Halszka (1997). "Barun Goyot Formation". In Currie, Philip J.; Padian, Kevin (eds.). Encyclopedia of Dinosaurs. San Diego: Academic Press. p. 41. ISBN 978-0-12-226810-6. ^ Crichton, Michael (1990). Jurassic Park. New York: Alfred A. Knopf. p. 117. ISBN 978-0-394-58816-2. ^ a b Duncan, Jody (2006). The Winston Effect. London: Titan Books. p. 175. ISBN 978-1-84576-365-7. ^ "Director Loses Utahraptor Name Game". 15 June 1993. Wikimedia Commons has media related to Velociraptor. American Museum of Natural History. "Fighting Dinosaurs: New Discoveries from Mongolia: Videos." c.2000. Three videos related to a fight between Protoceratops and Velociraptor. Hartman, Scott. "Velociraptor." SkeletalDrawing.com. Several artistic renditions of Velociraptor.